There may be snow on the ground in Iowa, and spring may be in my heart, but this newsletter will be devoted to Christmas and babies. Christmas will come first. This month you will receive the first 9" x 32" row in Ann's Lyrical Christmas Quilt. This row is full of baubles. I have made 4 videos that show how I made this row. I have shared those videos with the quilters who are following Apple Blossom Quilts on Facebook. Click here to check us out. We would love to have you "follow" us. I'll have more tips for you as we continue with this quilt. And hopefully my followers will begin to add photos of their projects. It isn't necessary to only post photos of projects you make from an Apple Blossom Quilt pattern. You are welcome to share photos of your projects as long as they include some applique. That is, your project must have some applique on it - somewhere. I also ask that you share the name of the pattern and the name of the designer. Also the projects don't have to be done and with binding on them. It's OK to post a work-in-progress. After all quilters, this is all about applique. If we only posted projects after they were finished we wouldn't have much to post, would we? Do you have a question about applique? Ask your question and hopefully someone will have an answer or a suggestion for you? It is my hope that some of you will make this quilt without any of the glitzy fabric - just 100% cottons - some of which may have a gold thread running through it. It isn't necessary to use sparkly fabric. Then there is a third group that I hope will make this quilt. I would encourage you to make this quilt without fabric with gold threads. It could even be with period fabric, 30's fabric or batiks. I don't have time to do it myself but would love to see the results. Won't you share your work with us, through Facebook, as this BOM progresses. Those of you who have taken a class from me probably gave up on this pattern long ago. I've been promising to get it in print for at least 7 maybe 8 years. Don't know why it has been such a stumbling block for me. In my classes, I show how I pad the body and belly of these sleeping bears. It makes them oh so soft and squeezable. I used one layer of batting over the entire bear. Then I added a second layer of batting over the belly. The pattern DOES NOT include the instructions for padding. I teach this technique on my second DVD "Let the Fun Begin". Click here for more information about this DVD. The sashing is paper pieced and the foundation pattern for the paper piecing is included in the pattern. It consists of two parts. One part is for the sashing, the second part is for the cornerstone. 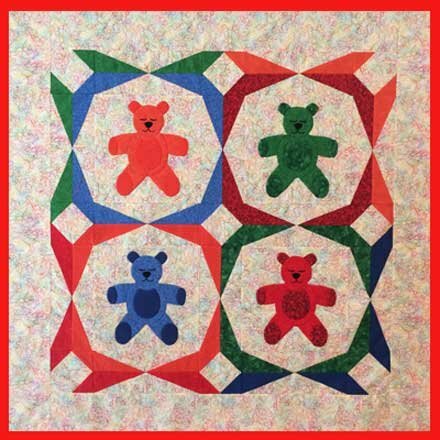 This little quilt is the perfect size (40 x 40) for that newborn in the family. It looks great in just about any color combination. It could be all pinks or blues, softer shades of the primaries used at the right or a unisex quilt in yellows and greens. Traditional browns would also be great. It is suitable for machine applique or hand applique. Click here to order this pattern. Paper pieced patterns for sashing and cornerstones are included. Directions for padding are NOT included. Suitable for either machine applique or hand applique. Paper pieced baby bottle pattern included. I'm going to be retiring "Delightful Flight" and "Baby Love My Way". I have several patterns left and have decided to offer them to you. I will give them to you when you purchase both "Froggie, Froggie" and "Sleepy Teddies". They will be free to those who purchase both of my new patterns. The cost will be $25.00 and you will receive all four patterns. Click here for your very own special baby offer. Did you purchase the "Froggie, Froggie" pattern in February? That's OK. I've printed out a list of those who have purchased this pattern. If you would like to take advantage of this offer, just go ahead and order "Sleepy Teddies" this month ($10.00). I'll check my list and when I find your name on it, I'll send you both free patterns as well. Check us out on Facebook. I have posted 4 new videos that show how I made the baubles row of Ann's Lyrical Christmas. Be sure to "follow" us. How to couch gold braid. How to applique a bauble cap. How to applique with stretchy, glitzy fabric. How to applique a little berry. During the coming month I will post further suggestions and hints about the baubles row of Ann's Lyrical Christmas. Come join us and share the fun.